Dominica, "Dominica", bold strike of scarce large undated flueron postmark on flap of Mar. 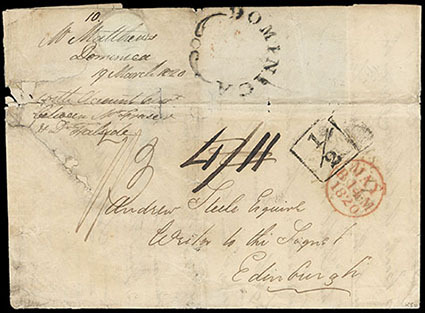 19th 1820 folded cover with second page of letter to Edinburgh, Scotland, red Edinburgh (5.14) arrival cds and framed "½" pence Scottish toll road tax handstamp, manuscript "4/11" rating update to "7/3" 7s3d final due; some faults, Fine and rare undated Dominica large flueron. 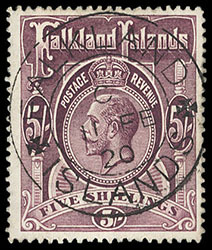 Falkland Islands, 1898, Queen Victoria, 2s6d-5s complete, neat town cancels, rich vibrant colors, Very Fine; with 2007 B.P.A. certificate. SG No. 41/2. 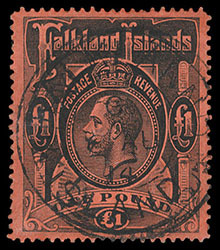 Falkland Islands, 1914, King George V, 5s reddish maroon, full o.g. 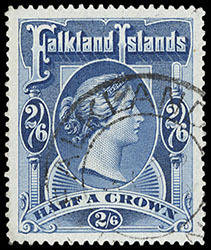 (minor gum tone), rich vivid color, F.-V.F., a scarce multiple. SG No. 67a £1,200 for singles ($1,580). 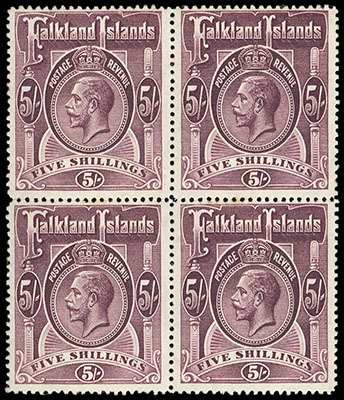 Falkland Islands, 1914, King George V, 5s reddish maroon & maroon, singles of each shade, both with virtually complete strikes of different type Stanley town cancels, Very Fine. SG No. 67a, 67b £440 ($580). 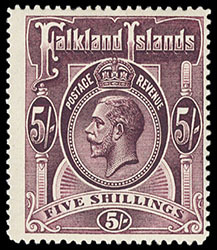 Falkland Islands, 1916, King George V, 5s maroon, o.g., never hinged, deep color, fresh and F.-V.F. Scott No. 37. SG No. 67b £130 for hinged ($170). Falkland Islands, 1914, King George V, 10s red on green, o.g., lightly hinged, bright and fresh, Very Fine. Scott No. 39. SG No. 68 £190 ($250). 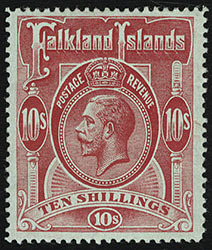 Falkland Islands, 1914, King George V, 10s red on green, socked-on-the-nose Port Stanley town cancel, choice centering, Extremely Fine. Scott No. 39. SG No. 68 £275 ($360). 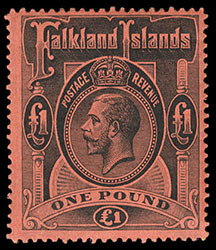 Falkland Islands, 1914, King George V, £1 black on red, full o.g. (horizontal gum bend), deep color, fresh and F.-V.F. Scott No. 40. SG No. 69 £550 ($720). 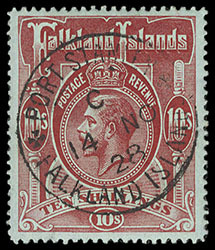 Falkland Islands, 1914, King George V, £1 black on red, central 1914 Port Stanley town postmark, wide margins, Very Fine. Scott No. 40. SG No. 69 £600 ($790). 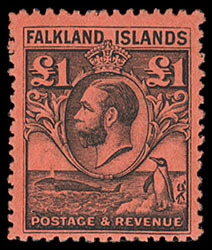 Falkland Islands, 1929-36, Whale & Penguins, ½d-£1 complete, o.g., 10sh & £1 top values never hinged, rich bright colors, Very Fine. Scott No. 54-64. SG No. 116/26 £700 ($920).